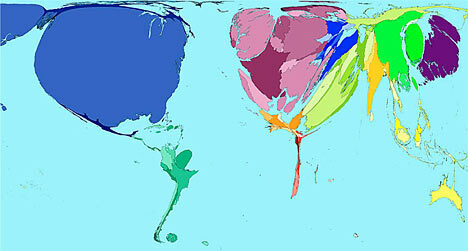 Cartogram maps are a type of thematic map that exaggerates things based on a certain variable. The space and size of the map is distorted in order to show information about places. In this map, countries are shown in relation to how much wealth it has. It is easy to see that countries like the United States, Japan, and Great Britain are very wealthy compared to the population. The countries of Africa, on the other hand, are so tiny compared to their population which means that Africa is a very poor continent. This shows that the wealth in the world is definitely not equal among each country.